If you’re looking for examples of legislative nonsense (and who isn’t? ), looking at a list of “resolutions” will always pay off. Because resolutions aren’t binding, legislators feel free to use them for everything from declaring a position on some irrelevant world event to honoring a local sports team. You could argue that this practice is bad because it wastes time they could otherwise devote to actual legislation, or that it’s good because it wastes time they could otherwise devote to actual legislation. There are even some examples of resolutions that are actually funny (on purpose), and I’m a fan of those only partly because it’s an excuse to mention the book I wrote that has a few of those in it. This isn’t as good as the Boston Strangler resolution (also Texas) or the New Mexico Wizard Bill (both in that book, coincidentally), but seemed worth noting. Not being Texan, I had not previously pondered the similarities between the Texas and Chilean flags, but they are in fact very similar. And Rep. Tom Oliverson (R.-Austin) would like to make sure Texans don’t confuse them when selecting emojis. No, wait, it’s the other way around. Chile has the blue square, and Texas has the full blue field on the left. Sorry! Just remember everything’s bigger in Texas, and you can keep them straight that way. Although Chile is actually bigger than Texas (291,933 square miles v. 268,597), and that could be confusing if you were to get that extraneous fact stuck in your brain. Apparently, Chile had its flag first, or at least it adopted the basic design in 1817. The Republic of Texas adopted its flag in 1839, and it became the state flag when Texas joined the Union (temporarily at first) in 1845. It’s not clear who designed the Texas flag, and there’s no reason to think it was modeled on Chile’s. As is usually the case, there were lots of other designs out there, actual or proposed; I have to say I find it kind of hilarious that according to this article, Texas might have had a flag with a rainbow on it, had a meeting about flag designs not “hastily adjourned” in 1836 because the Mexican Army was on the way. Anyway, the flags are in fact similar, and so their flag emojis of course are similar, and similarly confused. Oliverson’s resolution (right) aims to do something about that. 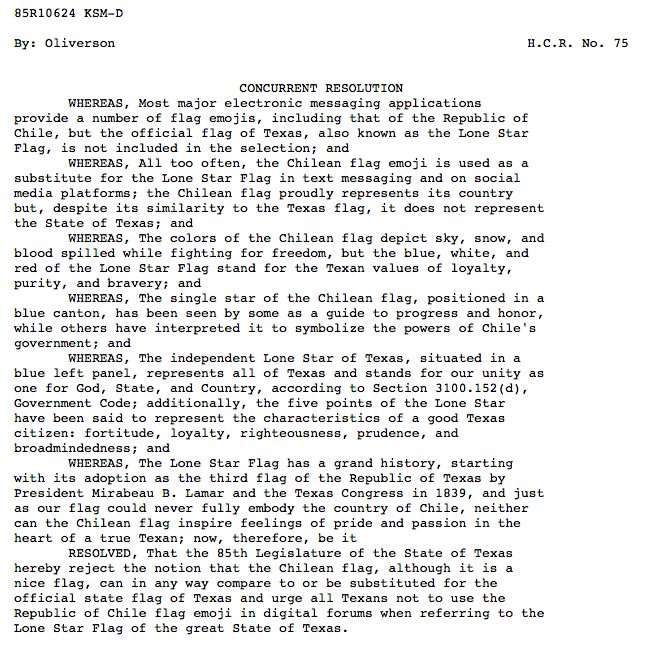 reject the notion that the Chilean flag, although it is a nice flag, can in any way compare to or be substituted for the official state flag of Texas and [would] urge all Texans not to use the Republic of Chile flag emoji in digital forums when referring to the Lone Star Flag of the great State of Texas. So far there has been no further action on the resolution, but it was just filed on February 16. In the meantime, consider yourselves only informally urged.